Last weekend’s retreat was tremendous. We witnessed the presence of God as we gathered around his Word (thank you for leading us Drew Smith! ), broke bread together at meals, opened our hearts to the ministry of the Holy Spirit in healing prayer Sunday morning, celebrated the sacraments Holy Eucharist and baptism (blessings on you Adeline Spies! ), laughed at ourselves at the Parish Fun Night, and enjoyed beautiful weather, outdoor games and sports, bonfires and s’mores, and entered the rhythm of Morning Prayer and evening Compline. Acorns on the Asphalt. At the retreat we also heard anew the call to be “fishers of men,” to be bold in our invitations to others to encounter Christ and His community. 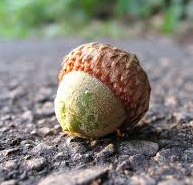 Every person we meet is like an acorn on the asphalt, a beautiful creation that is marked with the image of a towering oak, but without opportunity to thrive as long as it remains on the asphalt. It needs to be planted in good soil by a reliable water source. Our time in scripture took us not only to the call of Peter to be fishers of men, but also to the thriving tree planting by a stream in Psalm 1. Come to the Table. If you were at the retreat, for whom did you pray to meet Jesus as we took time to jot down a name or two? If you weren’t at the retreat, who might the Lord be leading to you to be bold with, to extend an invitation? Next Thursday night is a wonderful event for us practice this bold invitational life. Bring a seeking, open, or skeptical friend to a wonderful dinner and an evening talk/discussion about a Christian spirituality of food and meals. See details below. Interim Worship Pastor. I am very grateful to tell you that God has brought us an Interim Worship Pastor, Jim Echels, as we seek the Lord for His long-term provision. Jim has many years’ experience leading worship, is a working musician with a love for God and His church, and shares many of our values. He has already begun rehearsing with our worship team, will play with them as a “side man” for a couple of weeks (look for him on bass this weekend, drums the next), and then begin leading Nov. 20th. Thank you for serving us in this way, Jim! Meanwhile, we have opened up the search and application process. Please forward this link to anyone you know who might have interest. Lastly, mark your calendar now for next year’s retreat: October 20-22, 2017.